The man watering a lawn is seen in San Jose, Calif. on Monday, March 9, 2015. A ban on serving water at restaurants and bars unless it's requested. Hotels and motels must offer guests the option of not having their towels and linens washed daily. 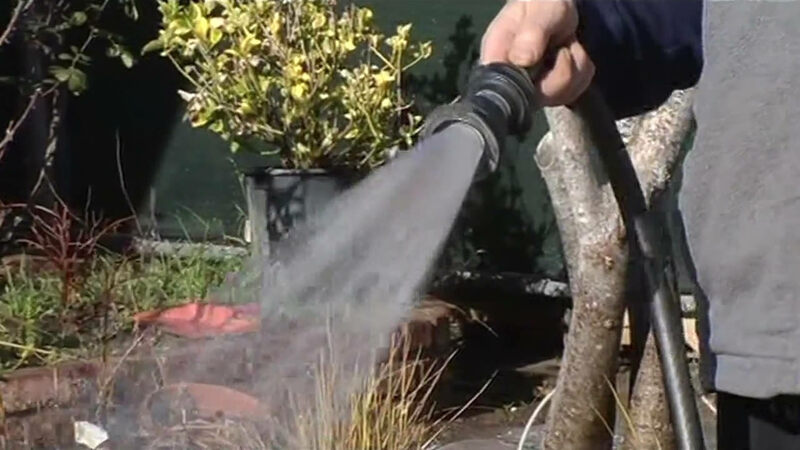 Watering lawns within 48 hours after measurable rainfall will be banned. Lawn watering will be limited to two days a week for water districts that don't yet have limits in place. "The objective is not to control the number of days people irrigate, but to control how much water they use on their landscape irrigation," said David Bolan with the Association of California Water Agencies. "We need to keep the eyes on that prize." The measures are designed to achieve a 20 percent reduction in water use. Violators could face a $500 fine. California is now in its fourth year of severe drought.